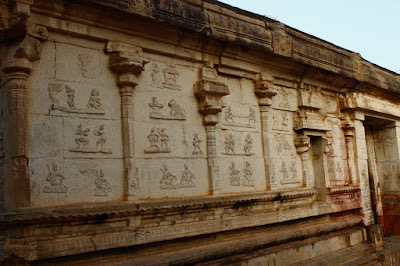 Penukonda was an important place in Vijayanagara empire. It is said to be one of the capital cities. Within Penukonda fort, which covers a large area on plains and hills, are several monuments of Vijayanagara period.. Gagan Mahal, Thimmarasu Bandhikhane, Kashi Vishwanatha temple, Yogi Rama Swamy temple, Pasirakkari Bavi, Narasimha Swamy temple, Narasimha Swamy temple on the hill, ruins of fort walls, ruins of Muslim tombs.. to name a few. 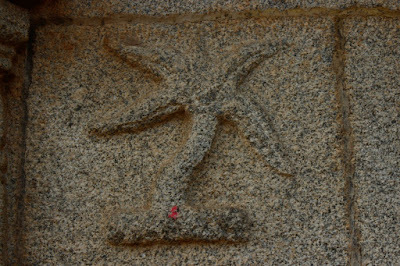 At the fort's eastern are several inscriptions of the walls, language could be Kannada or Telugu. A good portion of Penukonda town is within the fort. Even the civil court building seems to be a heritage from British times. On the way from Bangalore to Hyderabad, I stopped to check out the fort. However, once inside the fort I realised how vast it was and the number of monuments it contained. It would easily need few days of tour to cover it. 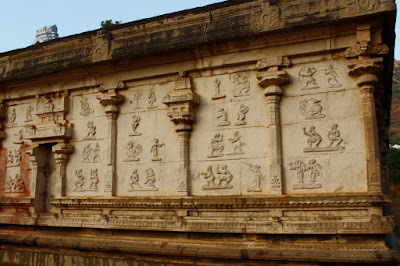 I first stopped at Gagan Mahal, the summer palace and harem of Vijayanagara kings. The monument's gate was locked, no idea where the care-taker was. So I moved on to Thimmarasu jail, a stone's throw from the palace. 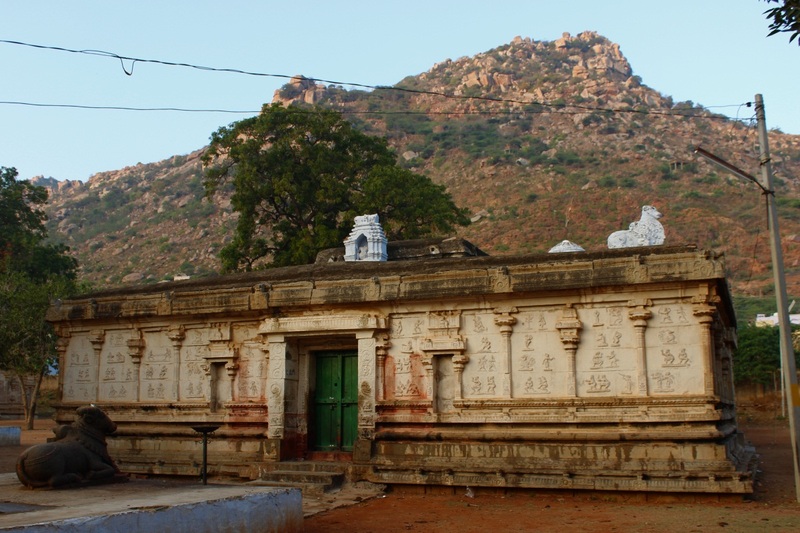 After the jail, close by were the two temples dedicated to Rama and Siva. Here's the gateway to Kashi Vishwanatha Gudi.. The temple door was locked.. the priest must have finished morning rituals and left for the day. 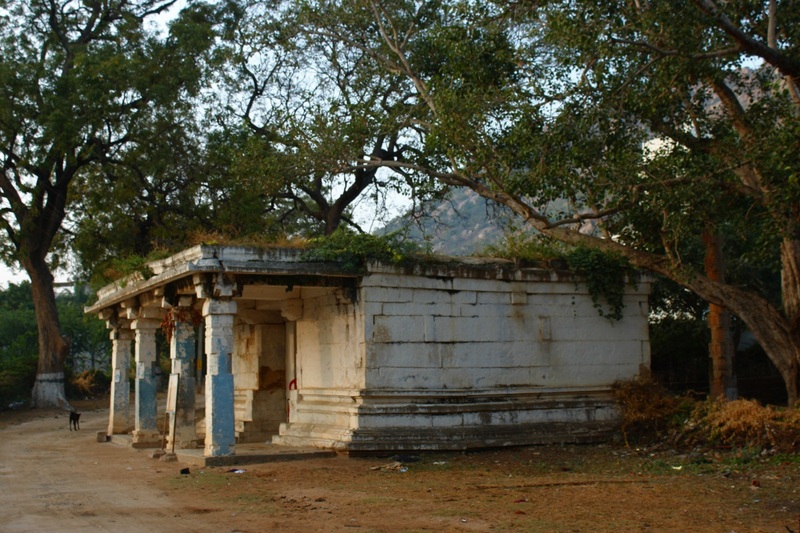 Probably the temple would open in the evening again. In the background is the hill on which are ruins of fort and Narasimhaswamy temple. 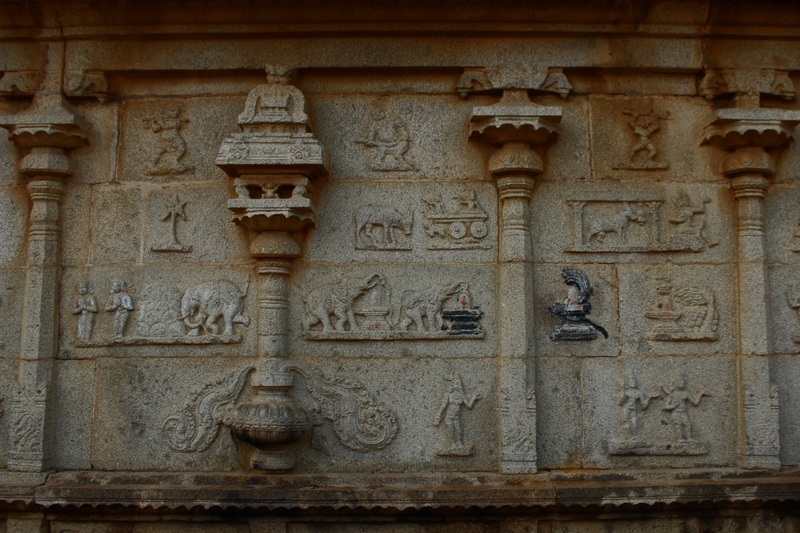 Shiva's vehicle Nandi positioned on the platform. 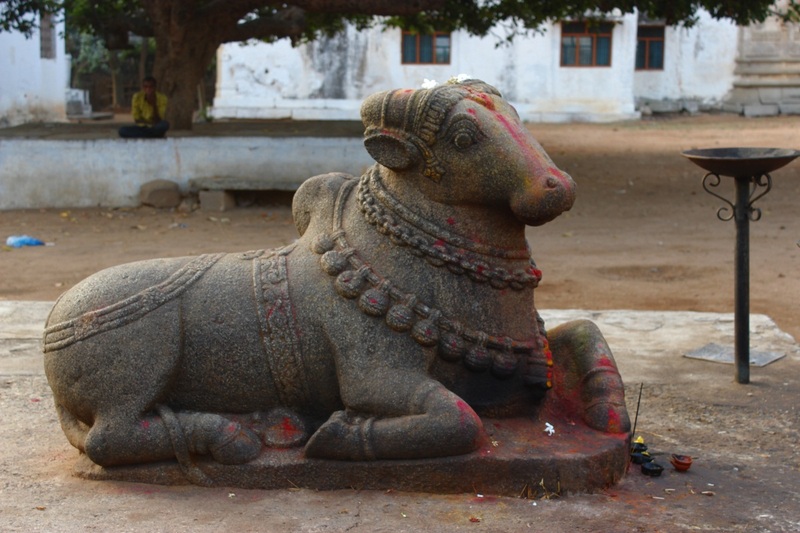 Garland of bells and a chain adorns Nandi's neck. 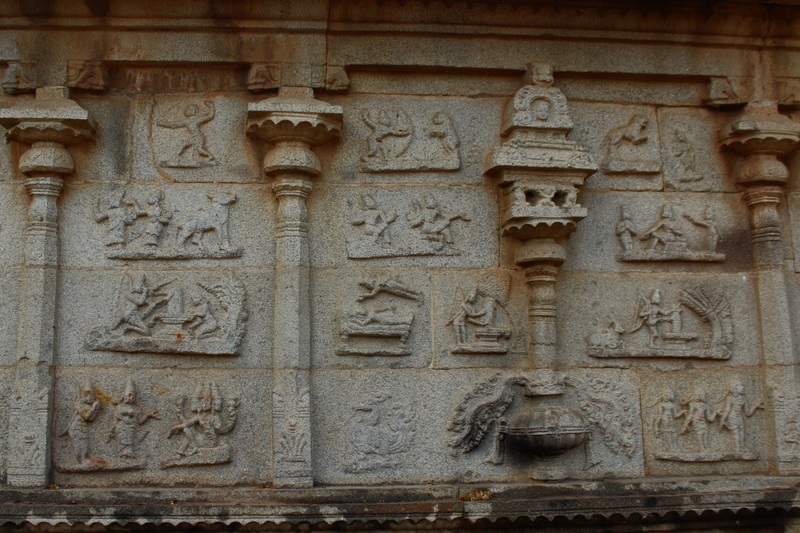 The right hand side wall are images of fish, monkey, peacock and male and female dancing humans. The temple has a conical Shikhara on its Garbhagudi, its made of brick and mortar. 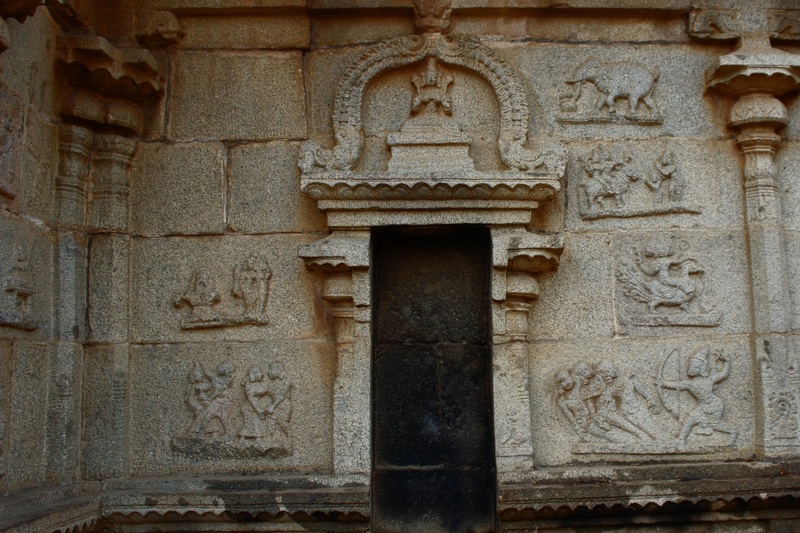 Towards the rear of the temple are images of an elephant worshipping Shivalinga, Shiva-Parvati astride Nandi, Shanmugha on his peacock, an archer shooting a group of four people and other images. 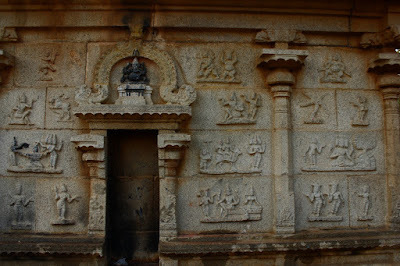 On this wall are two images of the great Shiva Bhakta, Bedara Kannappa among other images. 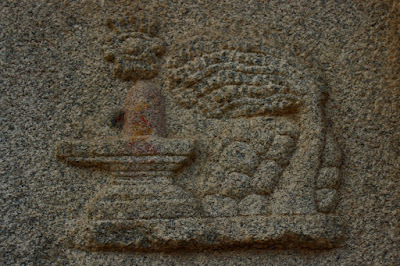 Kannappa's image has a palm tree too, this is something I've never seen before. 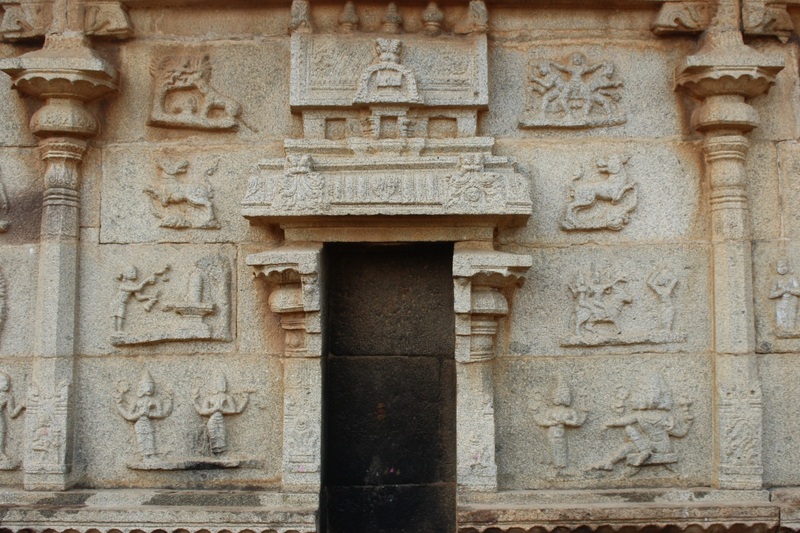 The quality of construction is not that good when compared to temples of Hampi. They seem to be done in a hurry or the sculptors were not highly experienced. On this wall are images of Sri Krishna, a palm tree, a bowing ox, a four-wheeled chariot, a cow ringing a bell (i think this is linked to a story in which the king has installed a bell which can be rung by subjects of the land seeking justice), an elephant showering a Shivalinga with water from its trunk. 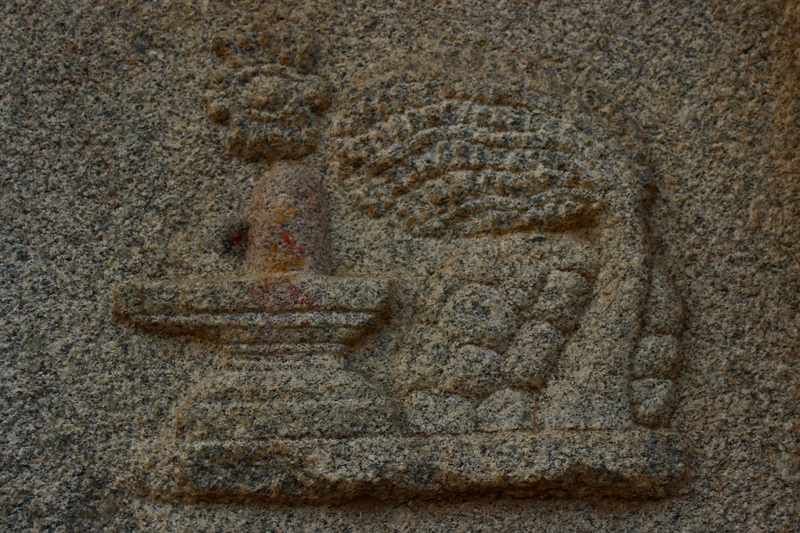 Shivalinga and a palm in wind. This also seem to be a palm. This wall shows images of Ganpati, a pair of plump men, Brahma worshipping Shivalinga, Brahma paying respect to Shiva-Parvati astride Nandi, and other images. 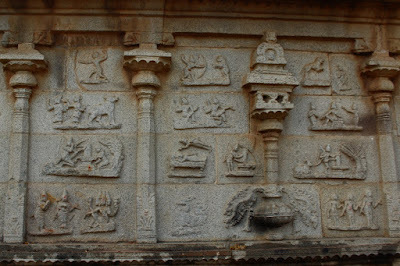 These are just few examples of sculptures on the outer walls. One day I wish to see the temple interior too. Perhaps in the month of October. 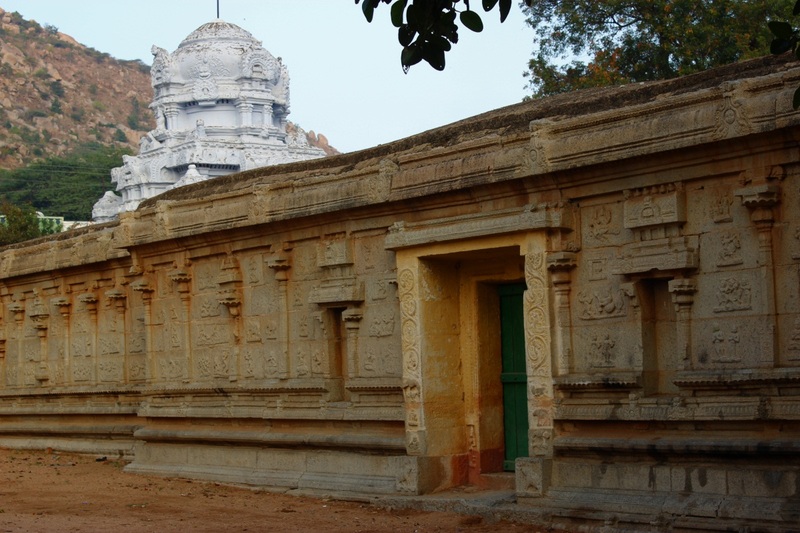 I head towards another temple, similar to this Kashi Vihwanatha temple, the neighbouring Rama Swamy temple.